Table Tents is rated 4.6 out of 5 by 5. 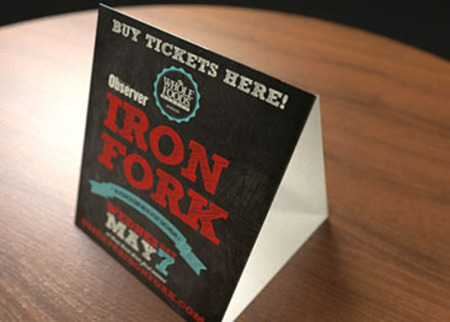 With so many standard options, it’s easy to design and print the perfect table tent cards. "Our Franchisees use table tents to cross promote services throughout our stores. We love the split shipment. We run co-op orders with our franchisees to achieve a bulk discount and then split ship to all stores." Rated 3 out of 5 by Spyro from Half right The printing looks very good. They did it in the time that I have, and shifted up in the time that I asked. Problem is, they printed it at the wrong size. it was a rush job that the client needed right away. I had to take it to my client printed incorrectly. He understood, but still, it made me look unprofessional. The vendor is going to give me a voucher for a reprint, so that half way makes up for it. Table tent printing is a popular and effective advertising strategy for restaurants, bars and nightclubs since they stand on their own to display information on any counter or table. They are also useful for hotels to display TV, room service, or local information. Stores can even use table tent cards to display sales or pricing. They are actually great for promoting any product or upcoming event. The specifications in the layout templates below will ensure your artwork prints correctly. These guides will help you design your artwork to our printing specs, giving you the best results possible. Here’s a simple idea to get more out of yours: Print on both sides of your table tent cards to get two designs for little more than the price of one! If you print on only one side, the inside panels will be blank. If you print a second offer or design on the inside panels, you can simply reverse the table tent and re-lock to display the second side. For example, print a patio special for the summer on one side and a fall event on the other. You can also think outside the box and design something in addition to a standard table tent. A desk calendar can fit nicely on a tent card. Put your contact and company information on one side, and a year-at-a-glance calendar on the other.